Page 69 — Bones-Jo is a touchy sort! Someone should just teach her to say “thank you” to a compliment! It’s been a busy week and a half — hanging a show of kitty art, off to Saskatoon Expo and back, and immediately into the home stretch of the children’s book project! I’m really looking forward to a quiet autumn (Happy Autumn, by the way — or Happy Spring if you happen to be on the south half of the planet!) with lots developing in the world of Mermaid Music. 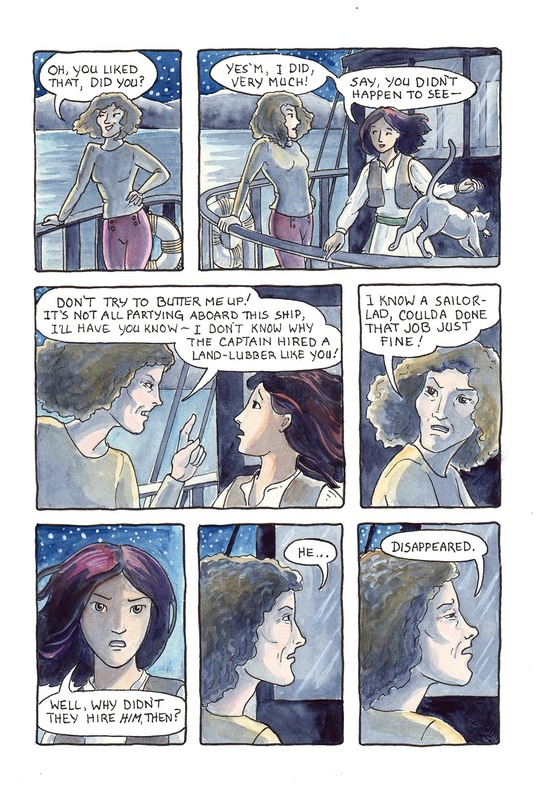 This comic was posted in Mermaid Music and tagged cat, comic, fantasy, graphic novel, mermaid comic, mystery, sailors, sea comic, ship, watercolour, webcomic.